"España es republicana", "a por la Tercera", "referéndum ya". Y así decenas y decenas. Cientos. Miles de mensajes inundaron las redes sociales tras el anuncio de la abdicación del rey. Las ciudadanos se movilizaron y convocaron a partir de las 20 horas concentraciones en las plazas de ciudades de todos los puntos de España y de fuera del territorio para exigir que sea el pueblo el que decida la forma de Estado y no se continúe el proceso de sucesión. Los partidos políticos que se han sumado, hasta el momento, a esta petición son Izquierda Unida, Podemos y Equo. La tricolor ha ondeado este lunes en algunos Ayuntamientos e incluso en el edificio de Les Corts Valencianas. En la mayoría de los casos han sido representantes de partidos de izquierda, fundamentalmente IU, los que a título personal han colocado las banderas, aunque en el Ayuntamiento de Altafulla (Tarragona) la colocación de la enseña republicana ha sido impulsada por el propio equipo de Gobierno. 21.13 La Policía cifra en 20.000 personas el número de congregados en Sol. 21.10 "Esa bandera no es la verdadera", "guillotina oe, guillotina oe", cánticos que se suceden en la Puerta del Sol. El que va ganando por momentos es "un bote dos botes, Borbón el que no vote", informa Mario Ruiz. El ambiente festivo reina (guiño, guiño) en la plaza madrileña. 21.03 "Aquí hay más gente que en Nochevieja", dice Mario Ruiz desde la Puerta del Sol. Las calles adyacentes a la plaza, como Carretas, están también repletas. La gente se sube incluso a la cúpula de cristal de la salida de Metro. 20.55 Los congregados en la Puerta del Sol de la capital se cuentan por miles. Esperanza, jubilada de 60 años, cree que a través de movilizaciones como la de hoy "y con grupos políticos como Podemos sí se puede llegar a la III República". Una compañera, Pilar, también jubilada, añade que con PP y PSOE "el cambio a una república es una situación utópica", informa Mario Ruiz. The news of Spain's King Carlos' abdication this morning warranted barely a headline in the US media. However, once again, the simmering social unrest of nations full of repressed citizens burst into action as widespread anti-monarchy protests erupted across Spain. On the heels of last week's European elections that saw extreme left and extreme right parties, it seems the Spanish monarchy's move has lit the blue touch paper in a nation still suffering from record high unemployment and record high suicide rates. Protesters carried guillotines and chanted "Neither king nor master" and "Long live the struggle of the working class" demanding a referendum. 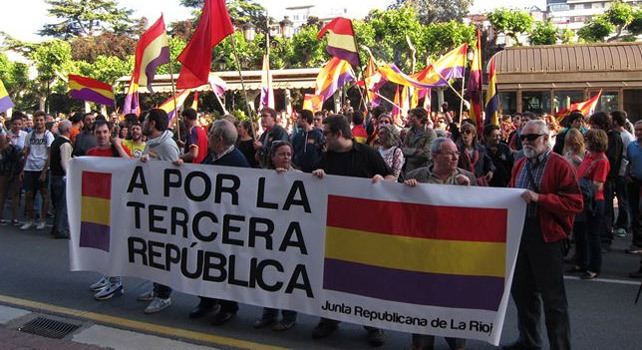 "Spain is republican", "at the Third", "referendum now." And dozens. Hundreds. Thousands of messages flooded social networks after the announcement of the abdication of the king. 's citizens mobilized and called from concentrations 20 hours in the streets of cities all over Spain and outside the territory to require that a people to decide the form of state and the probate process does not continue. Political parties that have joined so far, this petition are Izquierda Unida, and we Equo. The tricolor was flown Monday in some municipalities and even the building of Les Corts Valenciennes. In most cases they have been representatives of leftist parties, mainly IU, which personam have placed the flags, although the City of Altafulla (Tarragona) affixing the Republican banner has been driven by the team of government. 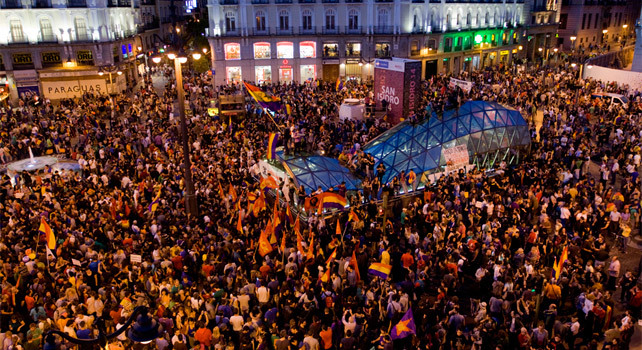 22.42 The largest concentration took place in Madrid's iconic Puerta del Sol This is followed by the Plaza Catalunya in Barcelona. Concentrations were replicated throughout Catalunya, Tarragona, Girona and Lleida. As in the Basque Country, which highlights the Bilbao, with thousands of people at the Arriaga square. In Seville's Plaza Nueva in Granada, Valencia, Zaragoza, Salamanca, Burgos, Palma de Mallorca, in various cities of the Principality of Asturias, Extremadura. 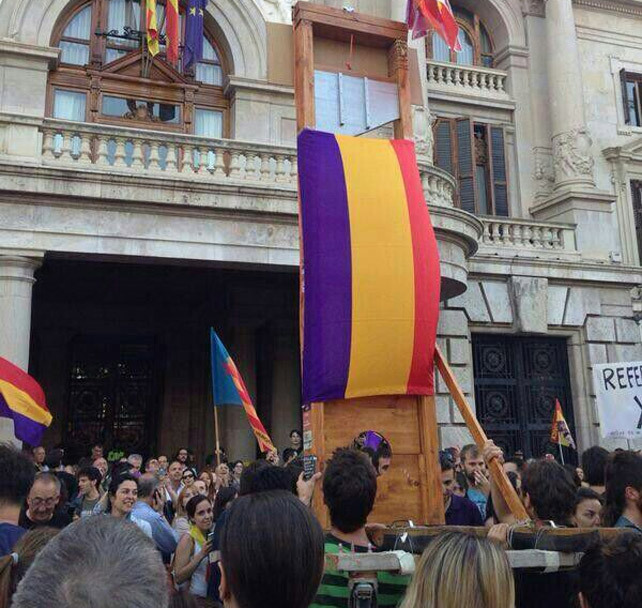 The cry has been resounding: image demonstration in Logroño. 22.38 In the following link you can see a photographic look at the various concentrations: The tricolor wanders throughout Spain. 22.35 At all points of Spain concentrations were performed. From Murcia to Asturias. Dozens (if not hundreds) of thousands of people have taken to the streets by the Republic and to claim that citizenship is to choose on the continuity of the monarchy. 22.33 A protester in the Puerta del Sol: "In 78 decided to put on the throne the puppet dictator Now let's put the son of the dictator puppet I say. defect." says Tristan, which is defined as a student and worker precarious, reports Irene White. 22.30 After the ceremony in the Plaza Catalunya, protesters have begun to move to the Sant Jaume square, home to the Government and the City of Barcelona, ? ?reports Europa Press. 22.20 In Paris, hundreds of people have also focused to claim the right of Spaniards to decide in a referendum. The mobilization was organized through social networks by the collective support in Paris for the match and we Garnet Tide, a network of international meetings aimed at coordinating the Spanish immigrants. "Neither thieves nor Bourbons. People decide. Can" was among the slogans of concentration, which mainly Spanish residents gathered in the French capital, reports Europa Press. 22.18 Protesters prevents the mouth of the Madrid Metro New glass dome at the center of the Puerta del Sol closes, specifically block fence that opens and closes automatically from inside the mouth Metro and gives access to Renfe, reports Irene White. 22.12 According to sources in the government delegation, 200 people gathered in Toledo, 400 in Albacete, Cuenca and other 200 300 in Guadalajara, reports Europa Press. 22.05 Some of the slogans chanted in the Puerta del Sol, "Neither king nor master"; "No two without three, republic again"; "Long live the struggle of the working class"; "The Bourbons sharks." Just good news that Spanish bond yields are all time record lows... or there would be real problems in the country! !